We all know the basic split- process or product crafter. Where process means that you make (predominantly) for the sake of crafting, and product means that you mainly want the finished product. I suppose that another subset of product crafting is ‘that looks pretty, I want one’. I suppose that my lacy shawl falls firmly in this category. I saw the yarn, wanted to make something from it and Glitz at the Ritz was the first pattern I thought of. I made it, I was happy with making it, and then I very rarely wear it. It just isn’t ‘me’ enough to wear. I can’t think of any other product crafting traits, anyone else want to weigh in??? Then there’s process crafting. Where you make something because you want to learn a new technique, or figure something out. My dad’s scarf falls into ‘learning a new technique’. I gave him a choice of 4 scarves, 3 of which involved double knitting… Learning new techniques is always fun, and I am loving knitting this up, but (in my mind, at least) it can’t be a product knitting thing because it’s not going to be mine, so I can’t get attached to it. I also keep thinking that there’s a third sort of crafting. 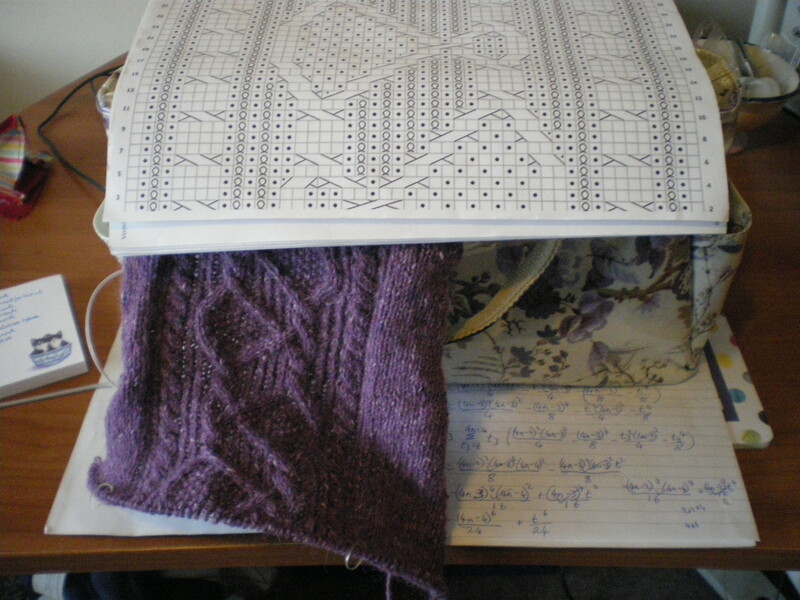 Where you convert something to something else, but then plan on re-crafting with your finished object. Such as spinning fibre, if you’re then going to knit/crochet with it. Or dye fibre which you’re then going to spin. And it’s not really ‘finishing’, so I don’t want to call it process or product crafting. In my mind, it’s more ‘converting’, but I can’t think of a word which starts with p for it. One thing I want to start doing, is weaving ribbon for the inside of button bands. I saw a post recently which suggested sewing ribbon onto button bands, so they won’t stretch so much. Which is a genius idea. And with my mind currently screaming ‘make all the things’, it made perfect sense to look up inkle weaving again, and how to weave ribbon so I wouldn’t have to find the right size ribbon. Yes, reigning my mind in sometimes can be hard. Sometimes I succeed, sometimes I don’t! As most of you already know, this year my buzzword is organise. Something I’ve been really struggling with this year is a rotation, as I have so many things I want to do! Last year, Christmas presents during the week and then my SALs over the weekend worked well, but now I’m not doing any SALs, and I don’t have any Christmas presents to make (yet…they’re all planned), and, well, it’s easier to just waste my time on the internet than pick up something to make. So, at the moment, I’m organising my WIPs so I can easily pick them up. I figure that the easier they are to pick up and start, the more likely I am to actually work on them!First of all, I need something very basic for my breaks when I’m sat at my desk. Well, actually, firstly, I needed to clean my desk up… but that’s done now, and I think it looks pretty tidy right now :)(No, you don’t get to see a before pic!). 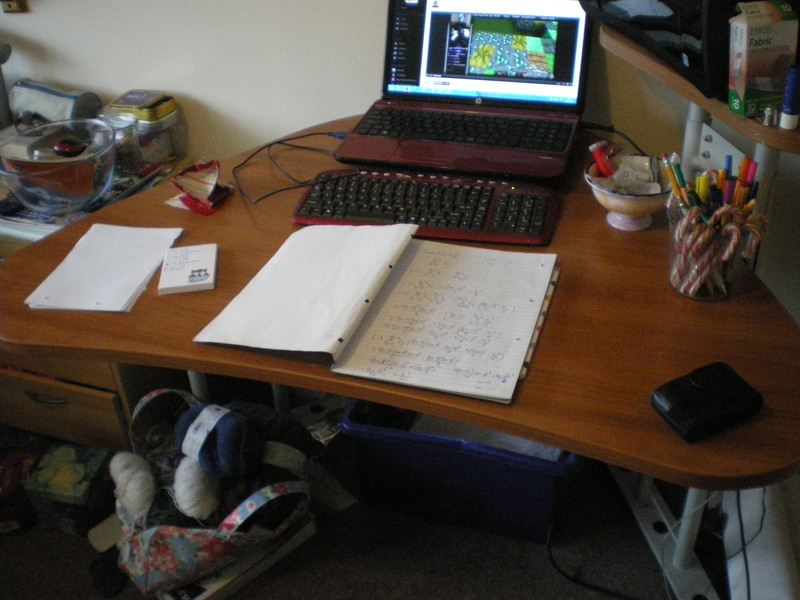 You can see my weekly planner in front of me, which is a very helpful reminder of what I’m having for dinner every day, and what I need to be in Uni for etc. I’m still finding my way around the notes section, but I’ll be sure to let you all know when I figure out what suits me for it.You can also see my half-finished juggling balls there, on the left. Having them right there (and not buried under a pile of work!) is making it very easy to pick them up and sew a line when I’m not working, or waiting for inspiration. I used to have a small box of embroidery threads on my right, when I was cross stitching small cards, but I’ve moved that out of the way into my cross stitching drawer. I’ve been finding that it was unnecessary (my cross stitching stuff is all in the drawer, so having it out doesn’t make me more likely to pick up something to stitch) and I was always worried that I would knock it off with my right arm while working. Which isn’t exactly productive for working! You can also see some scrap paper on the left, for sudden list-making. And a little jotter pad for a daily routine (times and what I’m supposed to be doing, very handy). 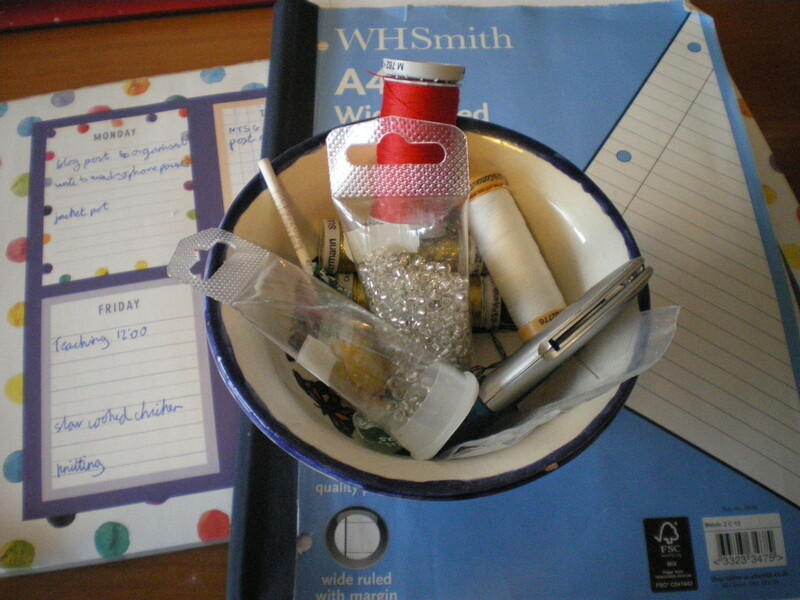 On the right, I still have my pot of pens, and also a little container for ‘all sorts’. It gets emptied from time to time, when it gets too full. At the moment, you can see the thread I’m using for my juggling balls, the thread I’m using for some repair work on my jeans, the beads I had been using on my socks, my USB stick and some other useful bits and bobs. I’ve also started carting around some knitted socks for when I’m at Uni sitting around not doing anything (I work at a maths drop in place which isn’t exactly popular! 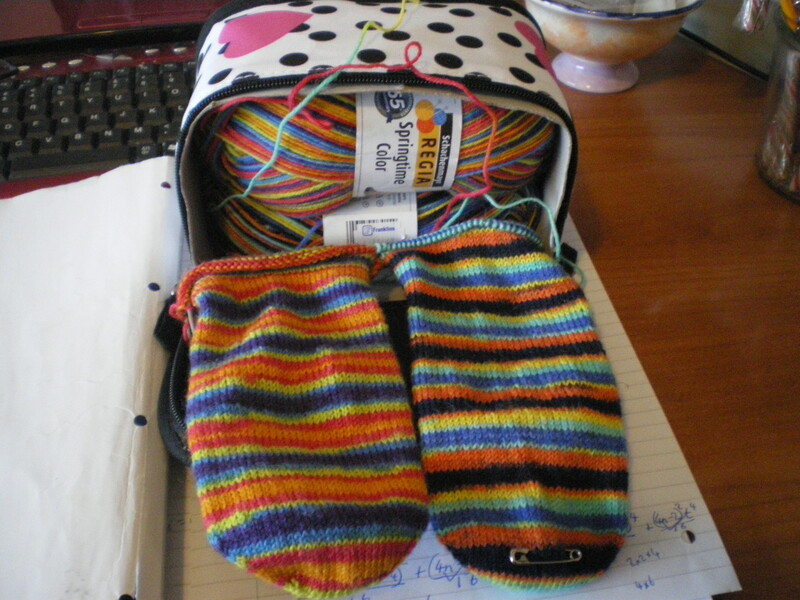 ), and therefore needed a container of some description to keep everything neatly together 🙂 I found this make up case in Superdrug, and it just about fits 200g of yarn (you can see that I knit TAAT different socks!). I’ve kept the cardboard insert in to help it keep it’s shape as I take loads of weird stuff in my bag, and I don’t want it to catch on anything when I pull it out (remember, we’re trying to make my crafting as accessible as possible!). I would quite like the handle to lie completely flat, but it works pretty well. At some point I’m going to embroider the directions for my vanilla socks (including lengths) on the outside so I have no excuse to not knit socks! I also now have a proper knitting bag!